Hello friendzzz.... How you all doing....I am back after a long time with a new recipe. Just waiting to to view beautiful and lovely comments from my lovely blogger friends. 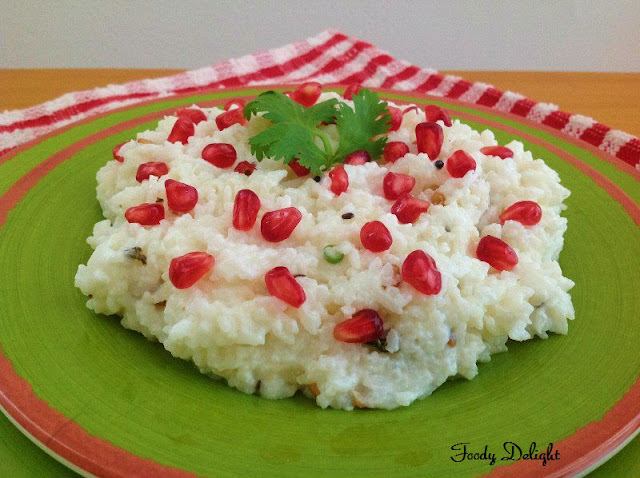 Curd Rice is the very popular comfort meal of South India. This rice is called by many names like 'Mosara Anna' in Kannada language, ' Dahi Bhutti' in marathi language, 'Dahyache shith' in Konkani language etc. Curd rice is very close to every South Indian people, their every lunch and dinner ends with curd rice, which has the a soothing effect, balancing the effect of other spicy dishes. 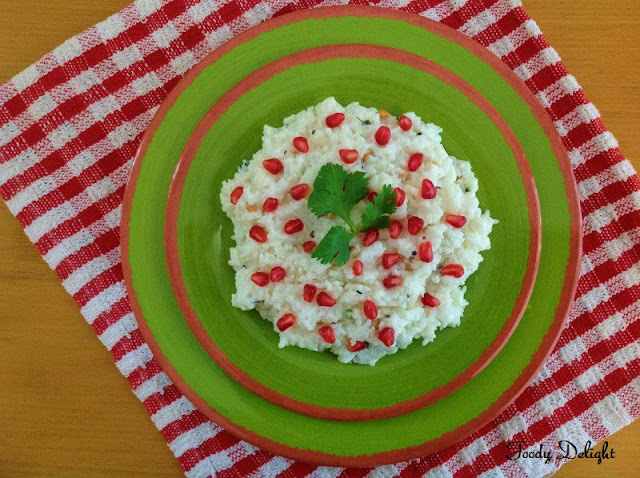 Curd rice is easily prepared by simply mixing boiled rice and yogurt. It is then seasoned with finely chopped green chillies, ginger and curry leaves and along with the seasoning of bengal gram, black gram, cumin seeds, mustard seeds, and asafoetida. One can also add grated carrot, dried grapes or pomegranate seeds. Like I have added..Curd rice tastes great with just a pickle or chutney. Do try it once and I am sure you all will like it. Cook the rice till they are soft. Keep it aside. Grind ginger and green chillies along with 2 tbsp of water in to a blender till it gets coarse mixture. Take yogurt in a deep bowl, add some salt, sugar and cilantro, mix add ginger and green chilli mixture and mix well. Add cooked rice in yogurt mixture and mix well. Heat oil in a pan add mustard seeds, cumin seeds, bengal gram, black gram, pinch of asafoetida and curry leaves. 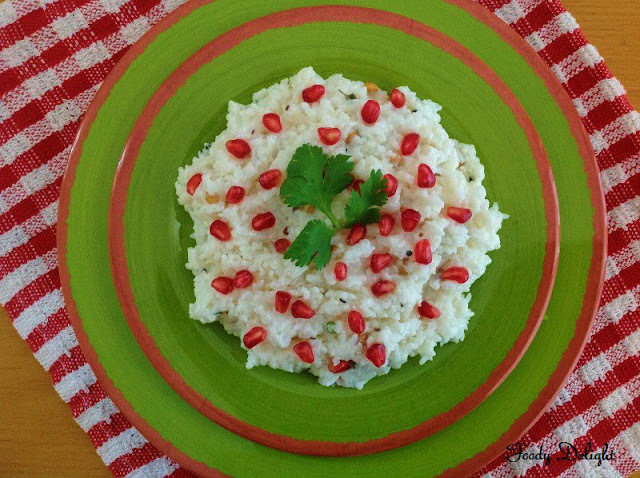 Garnish the curd rice as the way you like. I use pomegranate seeds and they look so beautiful. Well presented, curd rice is a must in my daily routine. Yum yum..what a refreshing looking curd rice..!! Can have it any time!